If you've ever trolled through the QoEMetrics database (a great way to while away a lazy Saturday afternoon) you may have come across a few tables that made you go "What the....?". One table that might catch your eye is the TraceRoute table. In all likelihood, this table is probably empty, which might make you wonder what it's for. Microsoft publishes pretty detailed information on the structure of the QoEMetrics database where you can find information about the TraceRoute table in this Technet article. 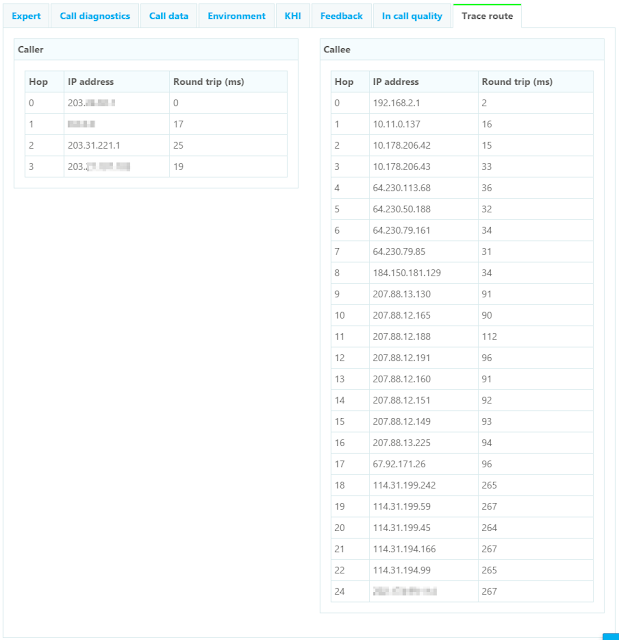 As you can surmise by the name, this table is meant to capture trace route information for calls. However, the table description gives no information on how to enable this feature. $x = New-CsClientPolicyEntry -Name "EnableTraceRouteReporting" -Value "TRUE"
Whoever has that policy applied to them will now publish trace route reports to the QoEMetrics database. However, the built-in Lync/SfB reports do not expose this anywhere, so you would only want to turn this setting on if you are using a 3rd party reporting and analytics tool such as Event Zero's UC Commander (FYI, if you don't already know, I work for them). This can be very useful to help track down network issues in the call path. This won't necessarily point the finger at a specific switch or router in every circumstance, but it can help. Be warned that enabling this will add a bit of size to your QoEMetrics database. The additional data isn't huge but its not negligible either. You should carefully evaluate the impact before turning this on.